Mario Cecchi Gori worked as a stockbroker before he moved to Rome in 1948. There he started producing movies in the late 1950s. He had his own production companies and worked with actors like Alberto Sordi and Vittorio Gassmann. From 1980 onwards he collaborated with his son Vittorio. In 1990 he became the co-owner of Penta film, together with Sylvio Berlusconi. He produced over 200 movies. From 1990 until his death in 1993 he was the president of the football club Fiorentina. 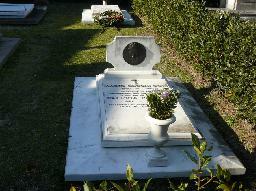 The grave of Mario Cecchi Gori at the Cimitero Monumentale delle Porte Sante, Firenze.